Favorite tangle: It is changing all the time. At the moment, pokeleaf. My favorite story or memory about teaching the Zentangle Method is: I love the unbelievable silence in classes with children. Through my experiences as a CZT, I have learned: There is always a solution! 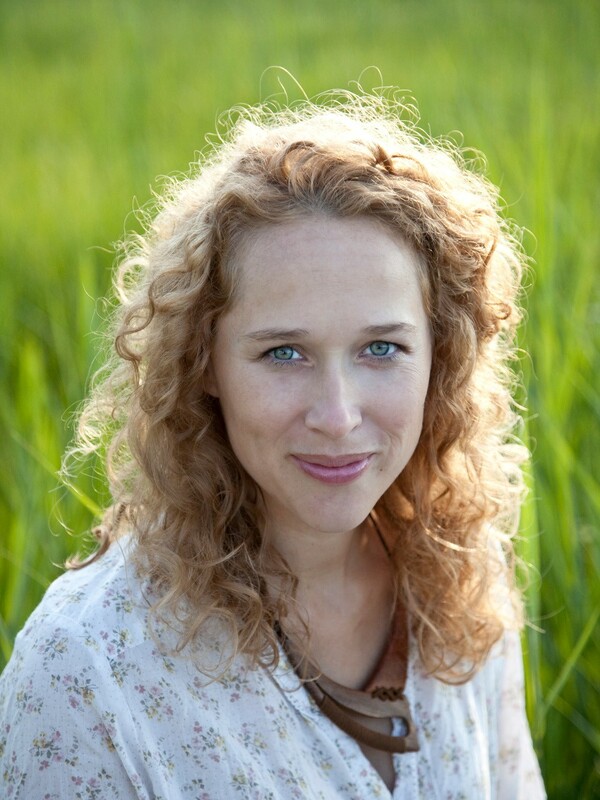 If I’m not tangling, you will find me…: Doing yoga or playing with my kids. I was stuck in the middle of a tile the other day. Doesn’t happen often, but every once in a while I hit a little road block. So paused for a bit and then for some reason heard my mother’s voice in my head, “When in doubt … aura." So I picked my pen back up and just started to aura some of the lines that were already there. Those auras then led me to my next strokes and then the next which evolved into more tangles and so on. 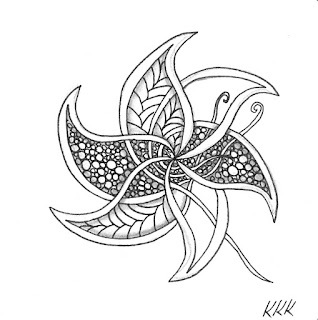 For those of you new to Zentangle, We use the word aura to describe a line that echoes or mimics a previously drawn shape or line. Auras are simple and beautiful. It is a part of my practice that immediately allows me to enter space of calm. After creating that tile I kept getting lost in the idea of auras and it triggered some memories from my childhood. I having flashbacks of my mom creating with auras before way before we called them auras. I suddenly remembered my mother helping us with projects. 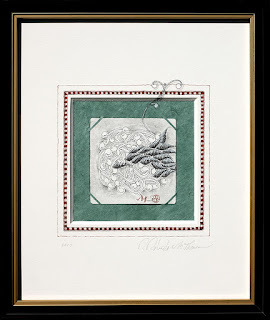 She would write fancy letters on something and then show us how to closely draw a border around the letter forms that mimicked the shape and then we would draw patterns around the bordering line. She would teach us how to cut out photos and then show us how to draw a line around the shape to create funky frames. We would draw cartoons, illustrations and block letters and then we would draw these fun framing lines around the compositions to pull it all together. It was one aura after another. I started to laugh out loud when I thought about when we were whiny or bored she would make us run around the house 5 times … basically creating human auras around the house. I realized she had been carrying around this trick for years. "When in doubt, aura." Was this part of her parenting mantra? How awesome. Once my head was in the aura zone … then I started to see the auras everywhere. Beautiful simple lines outlining and mimicking other lines and shapes within other art forms and works of art. A rock plummeting into a pond causing rippling circular waves. My loud voice in cavern repeating itself. The years of a tree’s life visible in its cross section with beautiful radiating rings. How amazing that we can cultivate this into our practice … just like a rock or a tree. 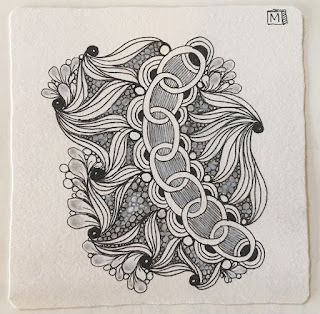 How wonderful that this amazing beautiful technique not only found a home in the Zentangle Method but a beautiful descriptive name as well. I love that The Zentangle Method offers that access to creative flow. No time? You can tangle in a few minutes. No space? you can tangle in the palm of your hand. No artistic experience? If you can write your name you can tangle. Don’t know what tangle to draw? Roll the icosahedron die. Still cannot decide what stoke to do next … well you can always just aura. When my Mom and Rick were coming up with method they had all of these experiences that lead them to make certain choices about the method and techniques, but I never thought about the aura component until now. So many of our tangles are variations and formula's of auras. So the next time your stuck on what to do on a tile … remember this. When is doubt, aura. Speaking of auras, check out this blog from 2014 where Rick and Maria explore auras. Traveling Tangles and . . .
At our CZT reunion last year, we held a silent auction to fund scholarships for CZT seminars. Several of the items available were original art by Maria and me. The effort was successful and because of it, we were able to help several people attend seminars in 2017. After the auction, several people asked that if they matched winning bid for our art, could they also get one. We said, "Sure!" We thought we had sent them all out until earlier this week we received a call and learned we had not. Yikes! So we gave this lovely person a choice of tiles and she chose one which Maria then matted and framed. When I saw what she had done, I interrupted her (as I often do!) so I could photograph it. This piece was just too beautiful not to share. It would also make a great blog post. Maria began the tile with a gentle field of mooka "sprouts." I added the indyrella over it. 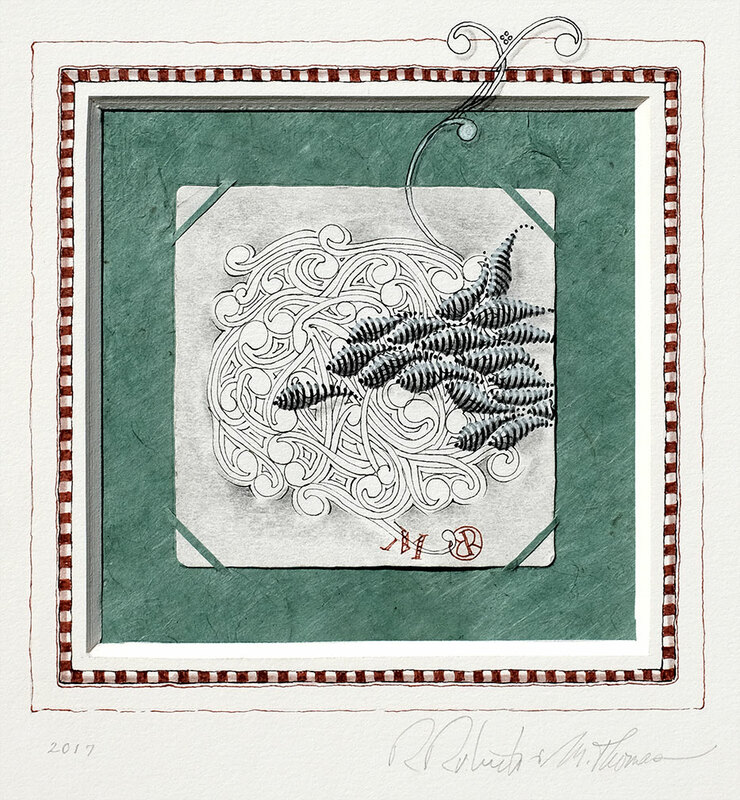 If you have the Zentangle Mosaic app, you will recognize this tile as part of a conversation we're enjoying about layering tangles. (You can find them all by searching with the #tranzending hashtag.) While you are searching, also search the hashtag #travelingtangles. This refers to tiles that two (or more) people create. In this case, Maria and I were only across the table, but many traveling tangles are created across the world. It is inspiring to see the blending of different styles and techniques! 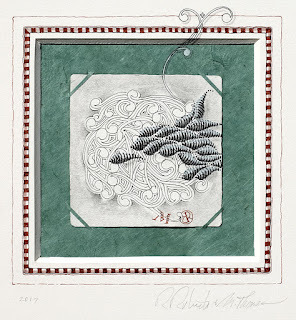 Maria mounted the tile into a piece of the Tibetan lokta paper that we used on our first Zentangle Kit boxes. Then she tangled and embellished the double thick matte and we signed it. 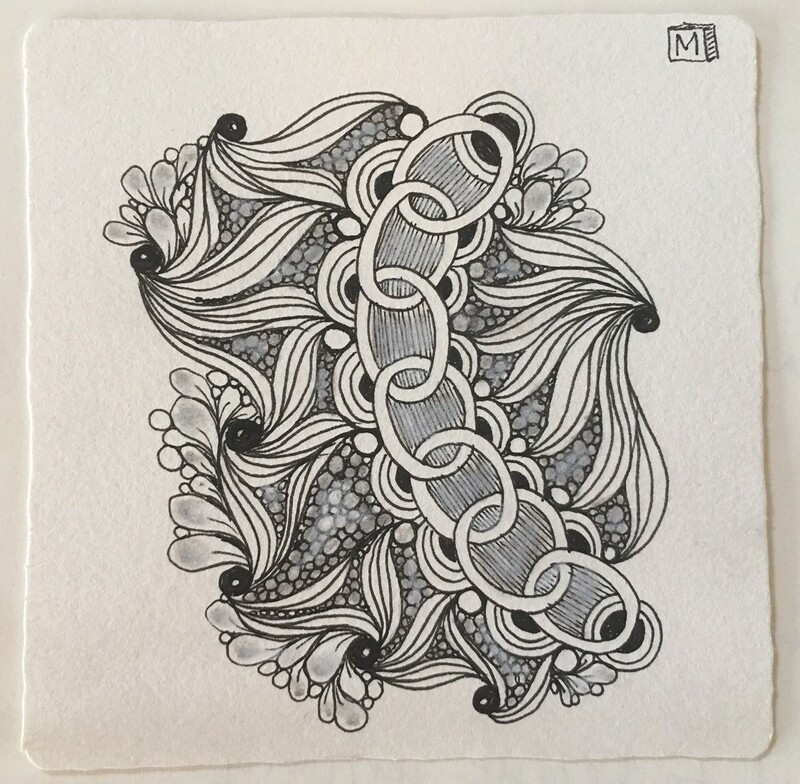 You can do all the searches discussed in this blog post with the free version of our Zentangle Mosaic app. It's available for Android smartphones, iPhones and iPads. I love to cook. From early on in my childhood I was drawn to the kitchen- not so much a hunger to eat but a hunger to create. I felt comfort in the process of preparing food to share with others. I was lucky enough to meet a chef who wanted to teach me and I spent the summer of my 15th year learning to use a knife - to chop an onion, to mince garlic, to peel and dice a carrot, some celery. It was all about practice and passion. He taught me to have respect for my tools and inspired a confidence in my abilities as a “creator” of food that I have never forgotten. I learned that even the most complicated recipes started with the same fundamental ingredients that I had just prepared and that was all I needed to go forth and create! Recently, I began prepping a meal for a gathering of friends. I set out my old cutting board, my favorite blade in hand, and began to chop. This recipe is one that I have made dozens of times. My ingredients, carefully selected and washed, are similar to the last time but always some variation becomes necessary. Hmm, I’m out of this but that would be a great substitute! As it often is, I am alone in my kitchen, my territory, and I quickly get into a quiet rhythm of peeling, dicing, mincing, chopping, and squeezing all the while getting lost in my chore. (sound familiar?) At last, these seemingly simple tasks spawns a glorious, nourishing dish for all to enjoy. I am not sure why it was this specific day that the thought occurred to me. This process, this repetitive task, is so much like Zentangle! When we first learn the method, we practice our crescent moon, our hollibaugh and printemps. We learn that only the best tools should be used for this future masterpiece. We learn that we are artists and that it feels amazing when someone appreciates you and your artistic ability. Then confidence ensues and we get a bit daring- a dash of dingbatz, a pinch of sparkle, a dollop of diva dance and before you know it you have a completely unplanned treasure for the eyes! With only a few basic ingredients (tangles) we have all the tools we need to create the most comforting feast for the eyes. Yes, there are days when we feel courageous or have a bit more time but both have boundless enjoyment for all to share. 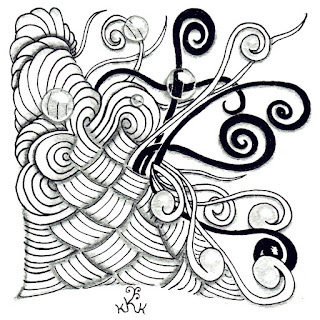 So, what’s your favorite Zentangle Recipe? Do you like simple, fundamental ingredients, or are you more adventurous and willing to take risks? Like all good recipes, Zentangle is meant to be shared. We would love to hear your favorite tangle combinations- inspiring us all to try something new. I love this phrase. It makes me ponder many things. I think about what a beautiful thing it is that people and many animals alike have developed sophisticated ways to communicate. I think about the complexity of both the spoken and written word. I think about how practically everything has a word or a name that labels it or describes it. And then how different words are used in different languages, cultures, or geographic locations to describe the same thing. And to think about this system again ... does that "thing" change at all without that label or word to identify it? Do we see it differently? Does a different word change or alter its existence? We use words to inform, identify, educate and communicate, but as Juliet says, "What's in a name?" For instance, here is a word that is frequently used and has very important meaning in so many places across the globe. In English we call it love, but in other languages you will see it as basque, voljeti, обичам, estimar, voljeti, láska, elsker, liefde, armastus, rakkaus, amour, amar, liebe, αγαπώ, szerelem, elska, is breá, amare, mīlestība, meilė, сакам, imħabba, elsker, люблю, љубав, láska, ljubezen, amor, älskar, любов, caru, ליבע, 爱, and 愛. And this is only to name a few. Each word identifies the same thing but the word itself that is used is different in each language. Another example is when I was a little girl, my mother would make this casserole made with layers of ground beef, corn and green beans and topped with mashed potatoes. It was called Pâté Chinois. 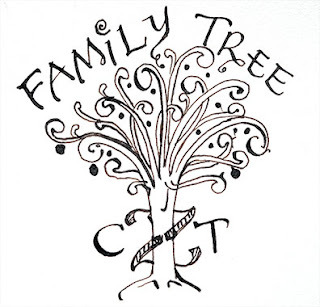 I thought our family invented it. Years later I was at school and on the menu was this thing called Shepard's Pie. When I saw what it was, I thought, that is not Shepard's Pie! That is Pâté Chinois! Did they steal our family recipe and change the name? How dare they? So it turns out my family did not invent this recipe, they didn't even name it. It is a very old recipe. With more than a handful of names and variations. Does what it is called change the way it is made or alter the flavor? Perhaps in our heads a little ... but not really. 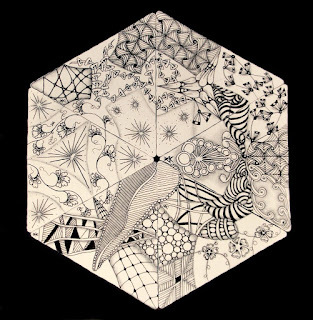 What does this all have to do with the Zentangle method? Well I think about the vocabulary of Zentangle. How we have such fun words to reference techniques and terms and we have names for all these amazing patterns we call tangles. This language is so helpful to identify, communicate and learn the Zentangle Method. We use language to teach this method. And we love to use it, but can we learn it and use it without any language at all? YES! We totally can! That is what is so amazing about this method. It can be beautifully understood, practiced and shared without a single word ... written or spoken. It crosses cultures, continents, religions, and generations. Zentangle art becomes a language in itself. We put names on tangles and their step-outs so that we can identify them and learn how to create them. It does not mean that we invented the pattern or that we were the only one to ever discover it or create a step-out for it. Are their some tangles that are perhaps original patterns? ... maybe? but many of our tangles are beautiful patterns rediscovered from history and nature. We just come up with a way to draw them and identify them. So is it possible for one tangle to have more than one name? Sure it is. Is it possible that the same tangle has multiple step-outs? Of course. Can there be multiple variations of the same tangle? Yes again.